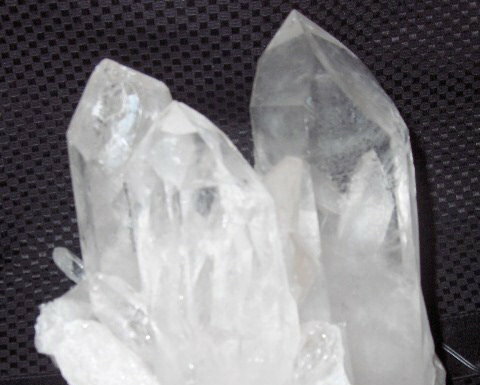 November/December News Alert: "From crystal skull explorer Joshua Shapiro"
"From crystal skull explorer Joshua Shapiro"
September News Alert: "Cell Consciousness"
As per (http://www.angelfire.com/hi/TheSeer/Lipton.html) Scientist and researcher Dr. Bruce Lipton discusses Cells : The interior of the cell has a negative electrical charge. A receptor acts like a switch which permits a positive electrical charge from outside the cell to enter through the cell membrane. This causes an electrical spark, or signal, which causes a vibrational frequency like Morse code to be generated. These electrical signals affect the proteins of the cell and regulate its functions. So there are receptors and processors and channels to allow environmental stimuli to evoke responses within the cell by changing the shape of the proteins in the membrane. And these receptors are so extremely sensitive that they can detect the presence of a single atom of glucose diluted with enough water to fill a whole harbor at the seacoast. According to Mayan Priest/Shaman, Don Alejandro Cirilo Oxlaj Peres: "... The prophecy says now is the time of the awakening. This is your job now, to awaken. The Vale of the Nine Hells is past and the Time of Warning has now arrived. It is time to prepare for the Age of the Thirteen Heavens. The time of 12 Baktun and 13 Ahau is fast approaching, and they shall be here among you to defend Mother Earth. The prophecy says, 'Let the dawn come. Let all the people and all the creatures have peace, let all things live happily', for the love must not only be between humans, but between all living things. They said, 'We are the children of the sun, we are the children of time and we are the travelers in space. May all the songs awaken, may all the dancers awaken. May all the people and all things live in peace for you are the valleys, you are the mountains, you are the trees, you are the very air you breathe'....Now is the time of return of the grandmothers and grandfathers. Now is the time of the return of the elders. Now is the time of the return of the wise ones. And the wise ones are all of you. Now is the time to go out into the world and spread the light. The sacred flame has been kept for this purpose and now the time approaches when you will be required to love all things, to love a world that has gone crazy, to rebalance the heavens and the Earth. For the Time of Warning has come to pass and the Warriors of the Rainbow are now beginning to be born. The Vale of Tears, the Nine Hells, is over and it is time to prepare for the 13 Heavens. The ancestors are returning, my brothers and sisters, and we do not have long. Now is the time that the prophecies will be fulfilled." Vatican chief astronomer Rev. Jose Gabriel Funes spoke publicly about his acceptance that we might not be alone in the universe. According to an interview with him in Vatican newspaper L'Osservatore Romano, the existene of ET "doesn't contradict our faith." From the Associated Press: "How can we rule out that life may have developed elsewhere?" Funes said. "Just as we consider earthly creatures as 'a brother,' and 'sister,' why should we not talk about an 'extraterrestrial brother'? It would still be part of creation..." The Bible "is not a science book," Funes said, adding that he believes the Big Bang theory is the most "reasonable" explanation for the creation of the universe. The theory says the universe began billions of years ago in the explosion of a single, super-dense point that contained all matter. But he said he continues to believe that "God is the creator of the universe and that we are not the result of chance." There has been an increase in of E.T. sighting reports. Britain, France, South America, Brazil, and other countries have released some or all of their documentation data regarding this. Even children's cartoons and programs have increased their interest in this subject. With the heavens possibly in the correct formation for such an event... Are we being prepared? James Constantopoulos, Ph.D., Professor of Geology and Chair, Physical Sciences Department, Eastern New Mexico University in Portales, on July 15, 2008, examined the mysteriously carved, quite hard, iron-rich rock. Image © 2008 by Linda Moulton Howe. Date: Monday, August 4, 2008 10:17 AM To: Recipient list suppressed:; Subject: [crystalskullexplorers] Apologies for Silence, some news Size: 23 KB Hello dear fellow Crystal Skull Explorers We hope this email finds you all well and apologize for our silence but I think due to the special energies and new Portals that will be open on Friday, the 8-8-8 many of us have gone through some personal challenges and health issues. We were fortunate to visit Milan, Italy at the beginning of July and work with our good friend Bill Homann, the caretaker of the Mitchell-Hedges Crystal Skull of Love. The two groups in Italy who supported the conference did a great job. The people were so friendly and helpful, we all had a great time. We also met Patricia Cori, who is an American living in Italy and Karen Tig, who is doing some great aura energy research with a special device and is also bringing Mr. Homann shortly to Germany this month. Both of these other speakers also brought their personal skulls for display so there were maybe 20-30 in total. I unfortunately got sick (I had a fever when I did my talk, I don't know how I managed as I passed out after) and still have a slight cough from this. Blue Arrow Rainbow felt it could have been some transformation as it started after I was in the presence of the Skull of Love. We will see. Anyway this illness with challenges with my car, have made July a slow time. So here are a few quick announcements for our members in the world. If you live in Germany, Austria or Switzerland and wish to view the Skull of Love, go to: www.mitchell-hedges.com/events if you are in North Carolina or Atlanta, tomorrow (Tuesday, August 5th) I am headed through these areas (the North Eastern part of North Carolina) -- drop me an email. There are talks and private sessions setup in NC you can find at: www.v-j-enterprises.com/csevents.com if you are in the UK, we are in Pembroke in Wales for a conference in September and there is work going on to setup two public talks in Glastonbury and London the last week of September as we explore to create a UK Crystal Skull Festival in 2009 with various friends there. In November, the Skull of Love will be in Edinburgh in Scotland again see Mitchell-Hedges site and in Australia in September and October the Hungarian Crystal Skull Festival was cancelled, the support team was unable to create the proper circumstances for it to happen so unfortunately in this year, there will not be an official Crystal Skull Festival - but in addition to the UK, we are exploring one in America for next year and possibly a mini one in Scotland Finally, coming back to the 8-8-8 there are going to be many people all over the world doing ceremony and meditations on this day, so you might want to check in, if you are not already linked. For myself, I wasn't sure where I would be or what I would be doing but I will be at a special PeaceMakers retreat in North Carolina, just came up in the last few days to help guide part of a meditation with my friend Cher there we believe after 8-8-8 many more doors are going to open for special light projects, so be ready for magic to start We thank you for your interest and support and if other news or special information comes up stay tuned to this channel. For our Northern Hemisphere members, enjoy your summer and vacation Let see what happens next in peace and light always Joshua with Blue Arrow Rainbow the crystal skull explorers PS - we will be sending to the list a special new project we are developing -- but spirit has asked us to wait till this Friday to link in with the special energies - hugs to all, our cs family!! A very Joyous Spring to you all! 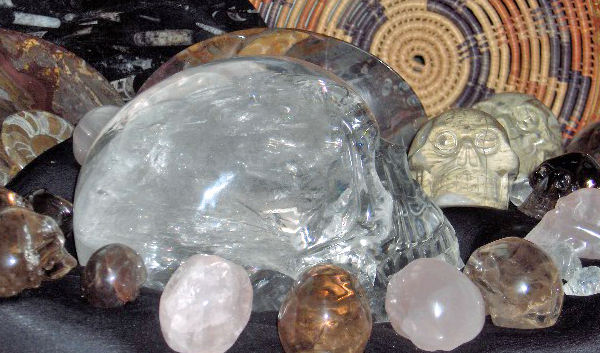 I'm excited to share two upcoming Arizona crystal skull events with you. These are small and intimate venues with limited seating. These events involve not one but TWO famous, life size crystal skulls. Synergy, the ancient crystal skull that I am the caretaker of AND the Mitchell-Hedges crystal skull. 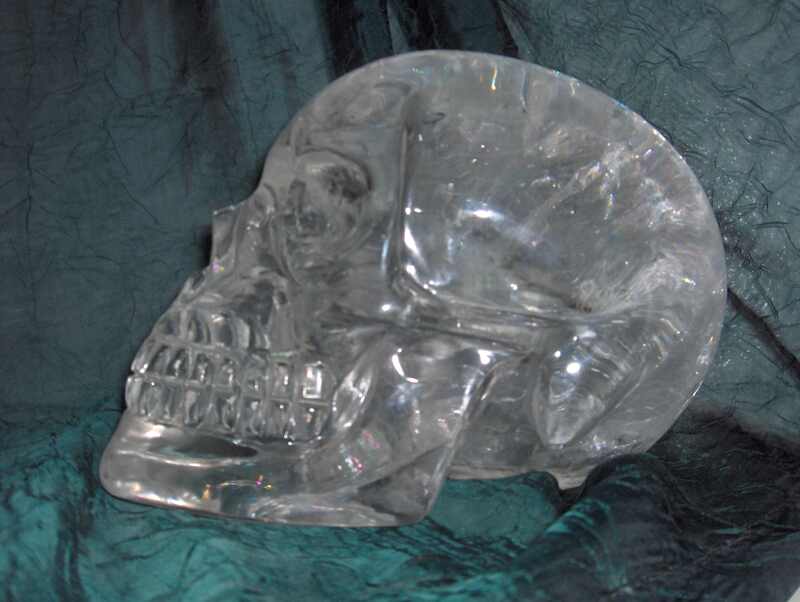 The Mitchell-Hedges crystal skull will be in Tucson, Arizona April 18, 19 and 20, 2008. I’m sending out this announcement as a favor to the organizer of this event, Lynn Gardner, as well as the new caretaker of this crystal skull, Mr. Bill Homann. As you surely know, this is a rare and unusual opportunity to meet and interact with this famous artifact! It has not been generally available for many years. This is a small venue and space is limited to 25 people per session. It is not being widely advertised and the exact location is being kept private until one registers. There are three sessions and you must pre-register to attend. The cost is $100.00 per session. For more information you may contact Lynn Gardner directly at 520-749-0291. I will be with Synergy in Sedona, Arizona on April 25, 26 & 27. We will be working with Dr. Chet Snow and his wife Kallista Snow. Seating is limited and therefore advance reservations are suggested. Kallista and I will also be doing a few private Shamanistic sessions with Synergy, over the weekend. They are already booking fast. please take a moment to forward this email to them or to your favorite online or email list. We are sending out this email with updates related to the crystal skulls. Well the year of 2008 is quickly turning into the year for the Crystal Skulls which we will be explaining why via this email. We apologize for all the news included but since the beginning of this year a lot is going on, so we will do our best to briefly discuss the news and provide the appropriate websites you can visit to read more for those things which interest you the most. Due to this film we have been contacted by a number of TV production companies who are working on new TV-based documentaries. In May before the Indiana film airs, the SciFi channel in America, will be airing a two hour documentary; there is a new documentary being made for the Smithsonian channel working with channel 5 in England (later in the year), Art5 in Germany and France in June will have one that features the Paris Crystal Skull and also we understand the History Channel has a project too. With all these new documentaries, the interest in the crystal skulls will expand greatly. For our American friends and visitors, we are dialoguing with our good friends in Memphis and in the next few weeks we will have a better idea where this event will be held. 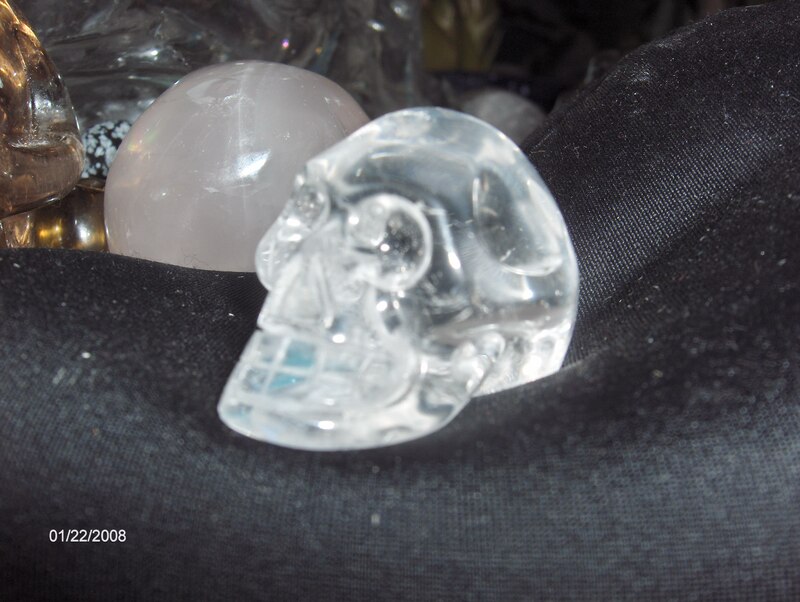 Tentatively we are discussing April of 2009 we hope to include at this Festival the "Mitchell-Hedges Crystal Skull of Love" (the new name) with the guardian Bill Homann along with various other interesting Crystal Skull guardians and teachers. Again news will be shared on the Crystal Skull Events web site about this new event as well. 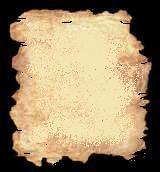 Additionally we have been working on our new book, Journeys of the Crystal Skull Explorers. Unfortunately however, we haven't had much luck yet to be able to release a printed version in English yet -- its very strange but it seems for this book there is a higher force that govern when each version comes out (for example the Dutch book took over three years before they decided to release their edition in 2006). Additionally we are updating the information in the book and have some new information. But finally we can say with absolutely certainly it will come out some time this year but we don't know when yet. If you would like to be included in that future mailing, when the book is ready, we do have an online form you can fill out so we will add you to the list. So thanks dear friends for your interest involving these crystal friends, -- hopefully at some future event we might have a chance to meet. the Crystal Skulls these days. Indiana Jones film is released. you hear from Bill directly. 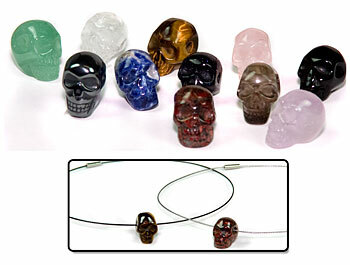 is the year of the crystal skull. chasing Indy so they must be guarding the skull. and since you are our close family I will tell you. for publisher and not one has shown up. collecting new and updated information. it will definitely be this year but not sure when. he can join the America Festival. things are about to change this year. where is this year going, its almost the end of January? the BBC back in 1995 or 1996. Journeys of a Crystal Skull Explorer New Crystal Skull eBook that includes 20 years of research and data collection by Joshua & Desy Shapiro. Includes a pictures and history of the crystal skull. We hope this email finds you well and that 2008 has been a very interesting year. Since the first of January, there has been many new activities related to the crystal skulls which has been keeping myself (Joshua) very very busy. 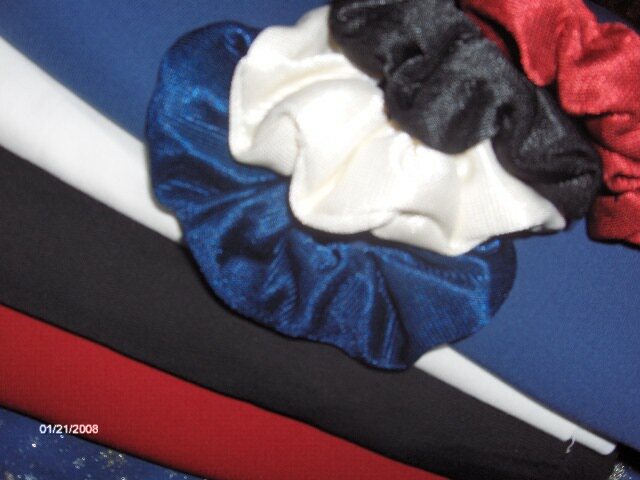 In any case, we have some news to share as the activities for 2008 begin to take shape. On January 10th in Budapest, the new coordination team was formed to begin planning for the 2nd International Hungarian Festival which now has a date of October 4th and 5th. Csilla Cseh of Golden Roads Travel Agency is heading up the new team and initial inquires about this festival can be sent to: goldenroads@goldenroads.hu Several local organizations have indicated an interest to support the new Festival which will feature more speakers and activities then the first one. We also are waiting to see, which hungarian publisher will be issuing a version of our new book. Speaking of the new book, we have been looking for a publisher in America via our agent but so far we haven't had any luck. If one is not found soon then we will go through the self publishing route (this is for the English edition) and try to have the book out before the Indiana Jones film in May. Stay tuned here for more details. We were recently contacted by a production company for a two hour show about crystal skulls that will be shown on the SciFi channel featured in America and a version in England that will air in May. As we have more details we will share this. Both Blue Arrow Rainbow and myself, have been invited to special events in Palma, Mallorca, Spain for a special retreat called, "The Power of Crystal Skulls: Awakening an Ancient Healing Tradition." from May 7th to the 14th. We are working on some webpages to provide additional details. This retreat will focus on the crystal skulls from many perspectives and also include Jaap van Etten and his wife Jeanne plus Michael Red Sky, a native american teacher and healer. If there is anyone who wishes more details before the webpages are ready, feel free to send us a private email. This should be a very powerful retreat as it will not feature lectures and workshops and private sessions but sacred ceremonies with several crystal skulls, special meditations and a tour of various sacred sites. Then as we mentioned in June, will be a spiritually guided tour to Sarti in Greece, from June 2nd to June 11th. Again it is a chance to work in some high energy places with the crystal skulls plus we will have some of the Shamanic drummers from Hungary, who were at the Festival there in October joining us. Golden Roads Travel Agency in Budapest is coordinating this tour and as soon as the English part of the tour is ready on their website, we will let you know. We also are waiting for the questions we sent to Bill Homann, the new caretaker of the Mitchell-Hedges Skull to be sent back. He is beginning to receive invitations from all over the world to share the crystal skull. Once we have this interview, we will be offering this to the list. Lastly, the story of the new Indiana Jones film continues to be closely guarded, we have heard rumors that Indy will find the skull in a Mayan pyramid and that they will link the crystal skull and other ancient artifacts to an ET origin. We just worked with a production company from France, who visited us this Sunday in Holland that will air a program in June about the Paris Crystal Skull on the Arte channel in France and Germany and also I was interviewed for a TV show in Greece called 'The Gates to the Unexplained' that will air in February. So expect this year to hear about a lot of TV shows discussing crystal skulls. Ok, everyone enjoy your week and we will keep you updated to other news as it happens. Journeys of a Crystal Skull Explorer New Crystal Skull eBook that includes 20 years of research and data collection by Joshua & Desy Shapiro. 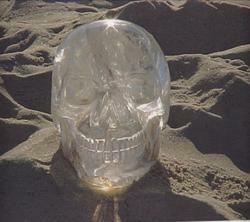 Includes pictures and history of the crystal skull. specifically mentioned herein, which allow the informed user to make their own decision.